Is this the Australian Grenache moment? In theory at least, Australian Grenache just had a jumpstart. For the first time ever, a Grenache has won the most famous wine award in Australian wine, with the Turkey Flat Grenache 2016 taking out the 2017 Jimmy Watson Trophy. Then, to follow it up, this week the inaugural results of the 2017 James Halliday Grenache Challenge were announced, with the Kay Brothers Griffon’s Key Grenache 2016 taking out the gong. All this attention on Grenache begs the question – has Grenache, as a single premium red variety, come of age? From a pure statistics point of view, the answer is that Grenache is definitely on the rise. According to the 2016 WFA Vintage Report, Grenache plantings increased by 5% between 2015/2016 and prices went up by an average of 23%. That’s the highest recorded rise of any mainstream red variety, and 5% above the closest grape Cabernet Sauvignon. Anecdotally, however, reports are mixed. The runner up wine in the Grenache Challenge was a Bethany Old Vine Grenache 2016 that comes off old vines that were apparently ripped out after the wine had been made. In turn, a few retailers that I’ve talked to say that sales is still uneven, and ‘anything without points’ still something of a slow burner. Conversely, Marco at Cirillo (caveat – I’ve worked with Marco before) reports that he can’t bottle his Vincent Grenache fast enough. 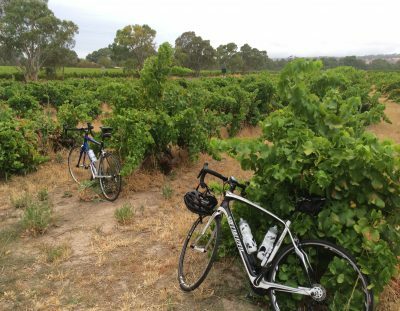 No matter what happens, Grenache is definitely a variety to watch, particularly as there is still plenty of old vine fruit out there that can be bought for a very reasonable price (especially in the Barossa and Clare). Personally I’m a big fan of Grenache and can see how it has a real untapped potential both locally and in our export markets. A quality bottle of medium bodied, vibrant, energetic Grenache is both delicious and rather Australian. We just need to own it. Meanwhile, here are four fine Grenache to have passed the bench recently. 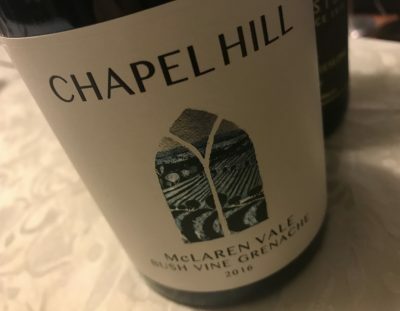 It’s interesting that McLaren Vale seems to be overrepresented in my Grenache highlights package, as there isn’t that much planted – with most of the fruit sourced from just a few grower vineyards in Blewitt Springs and McLaren Flat (with d’Arenberg also having considerable plantings). This has been a standout wine for years now. From the Waite Vineyard in the Onkaparinga Gorge and Tony Blagrove’s 1918 block at McLaren Flat. Luxurious and rather silky, this captures the exuberant fruit of Grenache, spending just 9 months in older oak. It’s even, well handled and perfectly medium weight, the finish soft and yet long, the joy all Grenache. Here’s the perfect example of the appeal of Grenache. Yum. Best drinking: 2017-2030. 18.5/20, 94/100. 14.5%, $70. Would I buy it? Not cheap but worth a few glasses at the very least. From the mature plantings at Chapel Hill. Bright ruby with a little violet, there’s a slightly furry edge on the nose, over a palate that alternates between curranty, blueberry fruit and something lighter. Lovely expansively juicy palate, a silky flow of fruit that is slightly syrupy, the silky, rather chunky fruit only interrupted by alcohol on the warm finish. Nice wine and lots of flavour and character here. Best drinking: 2017-203o. 17.7/20, 92/100. 14.5%, $30. Would I buy it? I’d share a bottle. Chester says that ‘This fruit comes in with quite high acidity. A portion spends time on lees. Not picking too ripe is very important. I think this could live into its 40s’. As ever with the d’Arenberg wines the tannins are the hero here. Squishy red fruit but sailing in a savoury direction. Thick tannins are great, but are they too gritty? I like it. Welcome juiciness too, if slightly rustic to finish. A more earthen wine than the Chapel Hill, and again high quality. Best drinking: 2017-2030. 17.7/20, 92/100. 14.2%, $29. Would I buy it? I’d go a few glasses. Easily my favourite of the wines under the Ben Riggs Mr. Riggs label. From the Dogridge Vineyard. Lovely sappy Grenache, with a little extra tang that could come form the 15% whole bunch. Lots of spice here. It’s a medium style, even though there is some cocoa sweetness through the generous middle. Full and so likeable in its richness and flow, though spicier and less rich than the more robust Chapel Hill. Best drinking: 2017-2029. 17.7/20, 92/100. 14.5%, $30. Would I buy it? I’d share a bottle. Willunga 100 Tithing Grenache. Drinking the 2010, with pork/veal meatballs in dense tom/herb sauce. Muscular. Good pinot is above my pay grade, so this does nicely. I really like a good Grenache but too many sweet ones out there for my liking. Shared a bottle of Turkey Flat 2015 on Sat night. Uber young and delicious. Totally agree with you! That’s why a few producers created the Grenache Symposium and the Grenache Association in 2010. It’s great to see how Grenache is highlighted in Australia and many other countries. Thank you for your article, your comments about the wines. Let’s enjoy Grenache wnes!